It's been an impressive 71 years since a league match between Sheffield Wednesday and Millwall ended in a 0-0 draw, and it's not a record either side will want to break tonight. 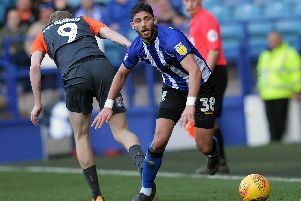 The last time the two clubs played out a goalless draw was way back in December 1947, so Owls fans can expect to get goals for their money at Hillsborough this evening. Wednesday are on a four match unbeaten run against Millwall in the league, with two wins and two draws dating back to September 2005. But, as Wednesday have conceded in all three of their Championship matches so far and have just three clean sheets in their last 17 league games, shutting out the Lions will be a task for Jos Luhukay's side. Millwall come into the match in good form and are unbeaten so far this season after draws with Middlesbrough and Blackburn and a win over Frank Lampard's Derby County. Neil Harris' side also progressed in the Carabao Cup after they overcame Gillingham on penalties last week, with Plymouth waiting in the next round. Joost Van Aken and Lucas Joao will be missing for Wednesday, while Adam Reach and Morgan Fox could return depending on late tests as they recover from injury. Millwall have a fully fit squad and have been unchanged in their previous three league matches.